Abraham Alfonse Albert Gallatin (January 29, 1761 – August 12, 1849) was a Swiss-American politician, diplomat, ethnologist and linguist. He served as a Congressman, Senator, United States Ambassador and was the longest-serving United States Secretary of the Treasury. In 1831, he helped found the University of the City of New York, now New York University. Born in Geneva in present-day Switzerland, Gallatin immigrated to America in the 1780s and was naturalized in Morgantown, Virginia. He ultimately settled in Pennsylvania. He was politically active against the Federalist Party program, and was elected to the United States Senate in 1793. However, he was removed from office by a 14–12 party-line vote after a protest raised by his opponents suggested he did not meet the required nine years of citizenship. Two years later, he was elected to the House of Representatives and served in the fourth through sixth Congresses. He was an important member of the new Democratic-Republican Party, its chief spokesman on financial matters, and led opposition to many of the policy proposals of Treasury Secretary Alexander Hamilton. He also helped found the House Committee on Finance (later the Ways and Means Committee) and often engineered withholding of finances by the House as a method of overriding executive actions to which he objected. Gallatin's mastery of public finance, an ability rare among members of the Jeffersonian party, led to his choice as Secretary of the Treasury by Thomas Jefferson despite Federalist attacks that he was a "foreigner" with a French accent. He was secretary from 1801 until February 1814 under presidents Thomas Jefferson and James Madison, the longest tenure of this office in American history. Declining another term at the Treasury, from 1816 to 1823 Gallatin served as United States Minister to France, struggling with scant success to improve relations with the government during the Bourbon Restoration. Gallatin returned to America and in the election of 1824 was nominated for Vice President by the Democratic-Republican Congressional caucus that had chosen William H. Crawford as its Presidential candidate. Gallatin never wanted the role and was humiliated when he was forced to withdraw from the race because he lacked popular support. In 1826 and 1827, he served as United States Minister to Great Britain and negotiated several useful agreements, such as a ten-year extension of the joint occupation of Oregon. Gallatin then settled in New York City, where he helped found New York University in 1831, in order to offer university education to the working and merchant classes as well as the wealthy. He became president of the National Bank in New York City from 1831 until 1839. At his death in 1849, Gallatin was the last surviving member of the Jefferson Cabinet and the last surviving Senator from the 18th century. Gallatin was born in Geneva, Switzerland, to wealthy Jean Gallatin and his wife, Sophie Albertine Rollaz. Gallatin's family had great influence in Switzerland, and many family members held distinguished positions in the magistracy, military, and in Swiss delegations in foreign armies. Gallatin's father, a prosperous merchant, died in 1765, followed by his mother in April 1770. Now orphaned, Gallatin was taken into the care of Mademoiselle Pictet, a family friend and distant relative of Gallatin's father. In January 1773, Gallatin was sent to boarding school. As a student at the elite Academy of Geneva, Gallatin read deeply in philosophy of Jean-Jacques Rousseau and Voltaire, along with the French Physiocrats; he became dissatisfied with the traditionalism of Geneva. A student of the Enlightenment, he believed in human nature and that when free from social restrictions, it would display noble qualities and greater results, in both the physical and the moral world. The democratic spirit of the United States attracted him and he decided to emigrate. In April 1780, he secretly left Geneva with his classmate Henri Serre. Carrying letters of recommendation from eminent Colonials (including Benjamin Franklin) that the Gallatin family procured, the young men left France in May, sailing on an American ship, "the Kattie". They reached Cape Ann on July 14 and arrived in Boston the next day, traveling the intervening thirty miles by horseback. Bored with monotonous Bostonian life, the men set sail with a Swiss female companion, to the settlement of Machias, located on the northeastern tip of the Maine frontier. At Machias, Gallatin operated a bartering venture, in which he dealt with a variety of goods and supplies. He enjoyed the simple life and the natural environment surrounding him. During the winter of 1780–81 Gallatin served in the defense of his new country and even commanded a garrison in Maine for a time. Gallatin and Serre returned to Boston in October 1781, after abandoning their bartering venture in Machias. Gallatin supported himself by giving French language lessons. Soon afterward, he sent a letter to Mademoiselle Pictet, offering a frank account of the troubles he was having in America. Pictet sensed this would be the case, and she had already contacted Dr. Samuel Cooper, a distinguished Bostonian patriot, whose grandson was a student in Geneva. With Cooper's influence, Gallatin was able to secure a faculty position in July 1782 at Harvard College, where he taught French. Gallatin used his early salary to purchase Template:Convert of land in Fayette County, Pennsylvania, near Point Marion south of Pittsburgh which he thought well suited for farming and as a staging area for selling land and goods. Gallatin honored his friends by naming the new property Friendship Hill. He moved there in 1784. In the spring of 1789, Gallatin eloped with Sophia Allegre, the attractive daughter of his landlady, who disapproved of him. She unfortunately died of unknown causes 5 months after their marriage. Possible causes of death could be complications of childbirth, or the common cold. Medical technology during the late 18th century was almost non existent. He was in mourning for a number of years and seriously considered returning to Geneva. However, on November 1, 1793, he married Hannah Nicholson, daughter of the well-connected Commodore James Nicholson. They had two sons and four daughters: Catherine, Sophia, Hannah Marie, Frances, James, and Albert Rolaz Gallatin. Catherine, Sophia and Hannah Marie all died as infants. In 1794, Gallatin was hearing rumors of mass exodus of Europeans fleeing the French Revolution. An idea struck his fancy: perhaps he should develop a settlement for these emigrants. Throughout the spring and summer of 1795 Gallatin pondered, planned and finally selected Wilson's Port, a small river town located one mile (1.6 km) north of his Friendship Hill. Collecting four other investors, three of them also Swiss, Gallatin had the partnership incorporated as Albert Gallatin & Company. Together they purchased Wilson's Port, Georgetown and vacant lots across the river in Greensboro. The partners named their new settlement New Geneva. With a company store, glassworks, gun factory, sawmill, gristmill, winery, distillery, and a boat yard along Georges Creek, the partners awaited the rush of settlers. The only successful industry of Gallatin's was the glassworks. An improved European situation and mild economic recession in 1796–1797 did not bring the expected wealth to the Gallatin partnership. As Gallatin struggled with the Federalists in the Congress, his partners happened upon six German glassblowers traveling to Kentucky. Convinced that glass would revive their sagging investment, the partners asked the Germans to set up shop in New Geneva. Gallatin was appalled with the idea, and considered it to be a gamble. Nonetheless, production of glass began on January 18, 1798. Window glass, whiskey bottles, and other hollow ware were produced. This was the first glass blown west of the Alleghenies. The glass business was not without its problems. Poor initial profits, material shortages and a labor "insurrection" combined to make Gallatin believe that the glass industry should be abandoned. By 1800, though, the business had made a turnaround. With the availability of coal across the river, the glass works were moved to Greensboro in 1807. Later in 1816 Gallatin would call the glassworks his most "productive property". Another industry to make its appearance at the New Geneva complex was the manufacture of muskets. In 1797 a crisis with France had flared into an undeclared war. The Commonwealth of Pennsylvania called out to its militia, only to find a shortage of muskets, bayonets and cartridge boxes. Contracts were awarded to private manufacturers to produce 12,000 stands of arms. Seeing an opportunity to relieve festering debts from the land and glass businesses, the western partners sought Gallatin's advice and political pull in the state government to acquire an arms contract. Initially against the idea, the mounting debts forced Gallatin to reconsider. He signed a contract in January 1799 to produce 2000 muskets with bayonets. The Gallatin partners subcontracted Melchior Baker of Haydentown to make the muskets. Lack of skilled labor and quality steel supported by poor management plagued the business. By April 1801, only 600 muskets had been delivered, fifteen months behind schedule. Seeing only complete financial ruin if he remained in the agreement, Gallatin transferred all contractual obligations to Melchior Baker and Abraham Stewart. During his fifth year as Minister to France, Albert Gallatin longed for retirement to Friendship Hill. Hoping to live off the profits of the glass business, Gallatin made substantial improvements to the house and grounds. It was not a happy homecoming. The economic "Panic of 1819" caught up with the glass business and forced its closure in 1821. While "contented to live and die amongst the Monongahela hills" Gallatin sold his beloved Friendship Hill and other western holdings at great financial loss. Daguerreotype of Albert Gallatin, original probably by Anthony, Edwards & Co. Almost immediately, Gallatin became active in Pennsylvania politics; he was a member of the state constitutional convention in 1789, and was elected to the Pennsylvania General Assembly in 1790. In 1793, Gallatin won election to the United States Senate. When the Third Congress opened on December 2, 1793, he took the oath of office, but, on that same day, nineteen Pennsylvania Federalists filed a protest with the Senate that Gallatin did not have the minimum nine years of citizenship required to be a senator. The petition was sent to committee, which duly reported that Gallatin had not been a citizen for the required period. Gallatin rebutted the committee report, noting his unbroken residence of thirteen years in the United States, his 1785 oath of allegiance to the Commonwealth of Virginia, his service in the Pennsylvania legislature, and his substantial property holdings in the United States. The report and Gallatin's rebuttal were sent to a second committee. This committee also reported that Gallatin should be removed. The matter then went before the full Senate where Gallatin was removed in a party-line vote of 14–12. Gallatin's brief stint in the Senate was not without consequence. Gallatin had proven to be an effective opponent of Alexander Hamilton's financial policies, and the election controversy added to his fame. The dispute itself had important ramifications. At the time, the Senate held closed sessions. However, with the American Revolution only a decade ended, the senators were leery of anything which might hint that they intended to establish an aristocracy, so they opened up their chamber for the first time for the debate over whether to unseat Gallatin. Soon after, open sessions became standard procedure for the Senate. Returning home, he found western Pennsylvanians (mostly Scotch Irish) angry at the whiskey tax imposed in 1791 by Congress at the demand of Alexander Hamilton to raise money to pay the national debt. Farmers could only export whiskey because transportation costs were too high for grain. Although Gallatin had opposed the tax before it was passed and attended numerous protest meetings, he counseled moderation. Nevertheless, the role he played in the Whiskey Rebellion in the early 1790s proved a lasting political liability, as President George Washington denounced the tax protesters, called out the militia, and marched at the head of the army for a portion of their way to put down the rebellion. A group of radicals, headed by a lawyer named David Bradford, staged incendiary meetings, to which they summoned the local militia, terrorized conservatives in Pittsburgh, threatened federal revenue officers with death, and called for rebellion. Gallatin calmed the westerners; with courage and persuasive oratory, he faced the excited and armed mobs, heartened the moderates, won over the wavering, and at last secured a vote of 34 to 23 in the revolutionary committee of sixty for peaceable submission to the law of the country. The rebellion collapsed as the army moved near, Bradford fled, and there was no fighting. Gallatin had the farmers agree on a reduction proposal on the tax on whiskey. Congress accepted the proposal, then later repealed the tax on whiskey. Gallatin's neighbors approved his advocacy of their cause and elected him to the U.S. House of Representatives for three terms, 1795–1801. Entering the House of Representatives in 1795, he served in the fourth through sixth Congresses. He was the major spokesman on finance for the new Jeffersonian Republican Party (later referred to by historians as the Democratic-Republican Party), headed by James Madison. By 1797, when Madison retired, Gallatin became the party leader in the House, a position now known as House Majority Leader. He strongly opposed the domestic programs of the Federalist Party, as well as the Jay Treaty of 1795, which he thought was a sellout to the British. When the Quasi War with France erupted in 1798 he kept a low profile, but did oppose the Alien and Sedition Acts. Although Gallatin opposed the entire program of Alexander Hamilton in the 1790s, when he came to power in 1801 he found himself keeping all the main parts, and supporting the Bank of the United States, which other Jeffersonians vehemently opposed. As party leader, Gallatin put a great deal of pressure on President John Adams' Treasury Secretary Oliver Wolcott, Jr. to maintain fiscal responsibility. He also helped found the House Committee on Finance (which would evolve into the Ways and Means Committee) and often engineered withholding of finances by the House as a method of overriding executive actions to which he objected. His measures to withhold naval appropriations during this period were met with vehement animosity by the Federalists, who accused him of being a French spy. Gallatin's mastery of public finance, an ability rare among members of the Jeffersonian party, led to his automatic choice as Secretary of the Treasury by Thomas Jefferson, despite Federalist attacks that he was a "foreigner" with a French accent. He was secretary from 1801 to May 1813 (and nominally until February 1814) under presidents Thomas Jefferson and James Madison, the longest tenure of this office in American history. The national debt was seen as an indicator of waste and corruption, and Jeffersonians wanted it paid off totally. They also wanted to buy Louisiana and fight a war with Britain, and Gallatin managed to finance these grand objectives, but he could not simultaneously pay off the debt. The debt stood at $80 million in 1801, and Gallatin devoted three quarters of federal revenues to reducing it. Despite spending $15 million on Louisiana, and losing the tax on whiskey when it was repealed in 1802, Gallatin trimmed the debt to $45 million. The government saved money by mothballing the navy and keeping the army small and poorly equipped. Gallatin reluctantly supported Jefferson's embargo of 1807–1808, which tried to use economic coercion to change British policies, and failed to do so. The War of 1812 (1812–1815) proved expensive, and the debt soared to $123 million, even with burdensome new taxes. Gallatin helped plan the Lewis and Clark Expedition, mapping out the area to be explored. Upon finding the source of the Missouri River at present-day Three Forks, Montana, Captains Lewis and Clark named the eastern of the three tributaries after Gallatin; the other two were named after President Jefferson and James Madison, the Secretary of State (and next President). The Gallatin River descends from Yellowstone National Park, followed north by U.S. Highway 191 past the Big Sky Resort, towards Bozeman. A few miles southwest of the city the river turns northwest, where Interstate 90 follows it to Three Forks. In 1808 Gallatin proposed a dramatic $20 million program of internal improvements—that is, roads and canals along the Atlantic seacoast and across the Appalachian mountain barrier to be financed by the federal government. This was something new, and many considered it outright unconstitutional. It was rejected by the "Old Republican" faction of his party that deeply distrusted the national government, and anyway there was no money to pay for it. Most of Gallatin's proposals were eventually carried out years later, but this was done not by the concerted federal action he proposed, but by local governmental and private action. Though often wasteful, this method enlisted local and private energies in large enterprises. While not a pacifist, he strongly opposed building up a navy and endorsed Jefferson's scheme of using small gunboats to protect major ports. The plan failed in the War of 1812 as the British, unhindered, landed behind the harbors. 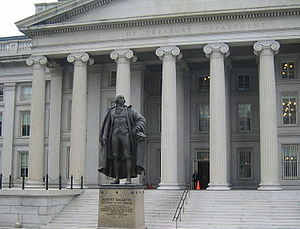 In 1813, the Treasury had expenditures of $39 million and revenue of only $15 million. Despite anger from Congress, Gallatin was forced to reintroduce the Federalist taxes he had denounced in 1798, such as the taxes on whiskey and salt, as well as a direct tax on land and slaves. Absent a national bank, and with the refusal of New England financiers to loan money for the war effort, Gallatin resorted to innovative methods to finance the war. In March 1813, he initiated the public bidding system that was to characterize subsequent government borrowings. A financial syndicate subscribed for 57% of the $16,000,000 loan, of which $5,720,000 came from New York City, $6,858,000 from Philadelphia, and $75,000 from Boston. He succeeded in funding the deficit of $69 million by bond issues, and thereby paid the direct cost of the war, which amounted to $87 million. Realizing the need for a national bank, he helped charter the Second Bank of the United States, in 1816. In 1813, President James Madison sent him as the United States representative to a Russian-brokered peace talk, which Britain ultimately refused, preferring direct negotiations. Gallatin then resigned as Secretary of the Treasury to head the United States delegation for these negotiations and was instrumental in securing the Treaty of Ghent, which brought the War of 1812 to a close. His patience and skill in dealing not only with the British but also with his fellow members of the American commission, including Henry Clay and John Quincy Adams, made the Treaty "the special and peculiar triumph of Mr. Gallatin." Gallatin returned to America in 1823 and was nominated for Vice President by the Democratic-Republican Congressional caucus that had chosen William H. Crawford as its Presidential candidate. Gallatin never wanted the role and was humiliated when he was forced to withdraw from the race because he lacked popular support. Gallatin was alarmed at the possibility Andrew Jackson might win; he saw Jackson as "an honest man and the idol of the worshippers of military glory, but from incapacity, military habits, and habitual disregard of laws and constitutional provisions, altogether unfit for the office." He returned home to Pennsylvania where he lived until 1826. 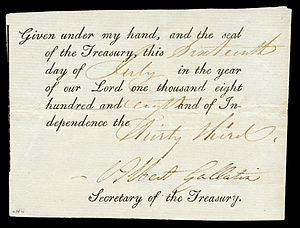 In 1825, Gallatin declined to serve as Secretary of the Treasury when he was offered the post by President John Quincy Adams. By 1826, there was much contention between the United States and Britain over claims to the Columbia River system on the Northwest coast. Gallatin put forward a claim in favor of American ownership, outlining what has been called the "principle of contiguity" in his statement called "The Land West of the Rockies". It states that lands adjacent to already settled territory can reasonably be claimed by the settled territory. This argument is an early version of the doctrine of America's "manifest destiny". This principle became the legal premise by which the United States was able to claim the lands to the west. In 1826 and 1827, he served as minister to the Court of St. James's (i.e., minister to Great Britain) and negotiated several useful agreements, such as a ten-year extension of the joint occupation of Oregon. His last great endeavor was founding the American Ethnological Society (AES). With his studies of the languages of the Native Americans, he has been called "the father of American ethnology." Throughout his career, Gallatin pursued an interest in Native American language and culture. He drew upon government contacts in his research, gathering information through Lewis Cass, explorer William Clark, and Thomas McKenney of the Bureau of Indian Affairs. Gallatin developed a personal relationship with Cherokee tribal leader John Ridge, who provided him with information on the vocabulary and structure of the Cherokee language. 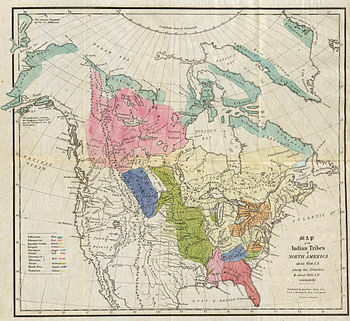 Gallatin's research resulted in two published works: A Table of Indian Languages of the United States (1826) and Synopsis of the Indian Tribes of North America (1836). His research led him to conclude that the natives of North and South America were linguistically and culturally related, and that their common ancestors had migrated from Asia in prehistoric times. In 1842, Gallatin joined with John Russell Bartlett to found the AES. Later research efforts include examination of selected Pueblo societies, the Akimel O'odham (Pima) peoples, and the Maricopa of the Southwest. In politics, Gallatin stood for assimilation of Native Americans into European based American society, encouraging federal efforts in education leading to assimilation and denying annuities for Native Americans displaced by western expansion.Template:Citation needed As of 1848, Gallatin was serving as president of the AES. In 1849, Gallatin died in Astoria in what is now the Borough of Queens, New York; he is interred at Trinity Churchyard in New York City. Prior to his death, Gallatin had been the last surviving member of the Jefferson Cabinet and the last surviving Senator from the 18th century. Albert Gallatin's grave at New York's Trinity Churchyard. The Gallatin School of Individualized Study at New York University honors his participation in the founding of the university. The ALBERT student information system at New York University is named for him. Gallatin's portrait was on the regular issue Prominent Americans series 1¼ ¢ postage stamp from 1967–73. Friendship Hill National Historic Site, a Template:Convert estate which includes the beautifully restored home of Albert Gallatin, is run by the National Park Service and is located in Fayette County, Pa. It is open to the public. There is a bronze statue of Albert Gallatin by James Earle Fraser located in front of the northern entrance of the Treasury Building. 250-ton U.S. Revenue Cutter Albert Gallatin, built in 1871 and lost in 1892. USCGC Gallatin (WHEC-721), a Template:Convert, high-endurance Coast Guard cutter homeported in Charleston, S.C., is named for him. A school district in Fayette County, Pennsylvania, in which his home, Friendship Hill is located is named the Albert Gallatin Area School District in his honor. 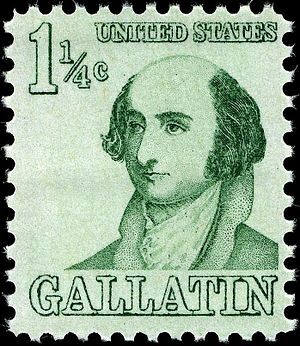 A 1967 U.S. stamp honoring Albert Gallatin. In the North American Confederacy novels by L. Neil Smith, Albert Gallatin intercedes with the Whiskey Rebellion to benefit the farmers instead of helping the US Government, causing the rebellion to escalate to become the Second American Revolution. This eventually leads to the overthrowing and execution of George Washington by firing squad for treason, Gallatin being proclaimed as the second president, and the abolishment of the U.S Constitution in 1794. During his presidency, a new caretaker government is organized in 1795 with all taxes being repealed. In 1797, a revised version of the Articles of Confederation is ratified, but with a much greater emphasis on individual freedom. In 1803, he and James Monroe arranged the Louisiana Purchase from France, borrowing money from private sources against the value of the land. Gallatin would serve as the president until 1812, from when he retired and was succeeded by Edmond-Charles Genet, who served as the third President from 1812 to 1820. In 1814, he would publish the Principles of Liberty, a systematic explanation of the philosophies of Thomas Jefferson and Thomas Paine. In 1836, Gallatin stepped out of retirement and defeated incumbent president John C. Calhoun in that years presidential election and served as the seventh President of the NAC until 1840. He was succeeded by Sequoyah Guess, who served as the eighth President from 1840 to 1842 from when he was killed in a battle by a sniper. After his death in 1852, mourning is observed all over the world and many revolutions that take place in eastern European nations in 1848 are known as Gallatinite uprisings. In 1876, a giant statue of Gallatin is erected in Lake Michigan. By 1986, a metric ounce .999 fine gold coin with his profile on it was being minted. ↑ Stevens (1888), pp. 11–12. ↑ 5.0 5.1 Stevens (1888), p16. ↑ At the time of the purchase, his land was originally a part of Virginia, but it became part of Pennsylvania soon afterward. ↑ Richard Mannix, "Gallatin, Jefferson, and the Embargo of 1808", Diplomatic History (1979) v.3 #3, pp. 151–172. ↑ Carter Goodrich, "The Gallatin Plan after One Hundred and Fifty Years." Proceedings of the American Philosophical Society 1958 102(5): 436–41. Stevens, John Austin. 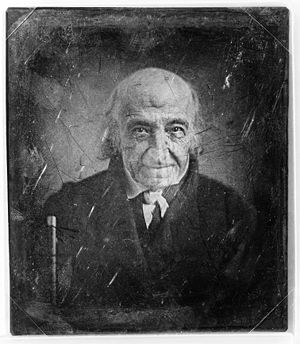 Albert Gallatin. 1883. This page was last modified on 4 November 2015, at 09:56.